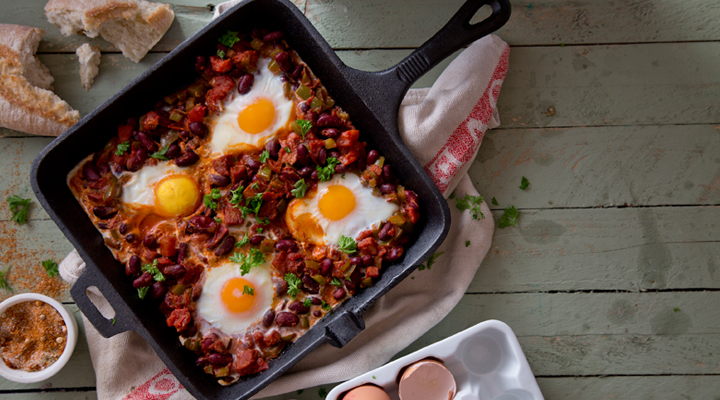 This is a great sharing breakfast and a perfect one-pan dish for the weekend. Heat a large frying pan over a medium heat and add the diced chorizo. Cook for 2 minutes, until it has started to release its oil, then add the chopped tomatoes, green pepper, worcestershire sauce and balsamic vinegar and season with a little black pepper. Turn up the heat and leave for 4 minutes to let it reduce, stirring occasionally. Add the drained kidney beans and mix well. Bring to the pan straight to the table and let everyone help themselves and serve with some warm bread and butter. Tip: You can add in any ingredients to this dish that you like.